Scientists from the University of Jaen, in Spain, have found that a single glass of commercial milk can contain up to 20 painkillers, antibiotics, and growth hormones. "Their breakdown, published in the Journal of Agricultural and Food Chemistry, revealed that cow’s milk contained traces of anti-inflammatory drugs niflumic acid, mefenamic acid and ketoprofen – commonly used as painkillers in animals and people." The highly sensitive test that found the chemicals is ground-breaking, and ideally it will be used by labs before food hits the grocery shelves. Let's talk about the real dangers that this article points out..the chemicals excreted from humans enter the water supply. Caffeine enters the water supply because it survives sewage treatment plants. The birth control pill and HRT have long been know to contaminate the water supply . Prozac in wild fish ? The doses of drugs were far too small to have an effect on anyone drinking them, but the results highlight how man-made chemicals are now found throughout the food chain. FWIW the US milk supply is one of the most regulated and tested industries in the world. "All milk—both organic and conventionally-produced—is strictly tested for antibiotics at the farm and processing plant. Any milk that tests positive—which rarely happens—is not allowed into the food supply." "According to the FDA’s most recent (2003) National Milk Drug Residue Data Base, less than one-tenth of 1% of all milk produced annually tested positive for animal drug residues, including antibiotics." I noticed that this isn't the first time you have misrepresented the facts of an article that you are reporting on. The article doesn't address human tolerances for these chemicals, either. If anything it casts doubt on your headline when you say that it took an unprecedentedly sensitive test to produce these results. While this post does make me curious, it doesn't seem responsible to call milk a toxic soup. where's the "like" button! Exactly Conrad..the title of the article is somewhat inflammatory and is a form of fear-mongering. Too bad because it was an interesting study that could have been used to promote public awareness about our water supplies and how we are impacting it as a global community. It would also be interesting to see if other anti-inflammatories like aspirin impact the water supply as well or is it only these newer designer NSAID's that are the problem.Same with the anti-depressants . As far as the hormones from HRT and birth control again this has been an issue for years and it would be nice if there were a mechanism developed to clean the out of the water supply. "The doses of drugs were far too small to have an effect on anyone drinking them..."
Fearmongering to get clicks. Hope you get paid enough for this. Shame on you! My headline was based on the article. The study was about commercial milk and they indeed did find it to be a toxic soup. And actually, I was writing like this long before foodista, FOR FREE on my own site. And no, we don't get paid by the click. I'm not "fear-mongering". Instead, I'm trying to awaken people to the fact that much of the food supply is TOXIC. This is as funny as when people claim eating real food is elitist. The line "The doses of drugs were far too small to have an effect on anyone drinking them" indicates that the milk is not toxic, and therefore the title of the article is misleading. I think we should be focusing on getting food to people that need it, rather than concentrating on making our own food "organic"
And the levels stated in that are less than 1ug/kg - 3ug/kg- you would have to drink a thousand litres (1l ~ 1kg) to even get a mg- and you have to drink all that without excreting anything. And where did you get your holistic nutritionist qualification? No where in this article do I mention raw milk? I am simply reporting what I read off another article. I posted a picture from the official study. And Yes, in my opinion 20! Chemicals IS toxic soup. People need to stop arguing the semantics, such as the title (which I stand by) and look at the real issue. If we were going to get into the grass-fed cow issue, I would say this. MANY of the chemicals given to factory farmed cows are simply not given to the grass-fed variety. By definition that milk is less toxic. Cows that live on grass don't need drugs because they receive vitamin d from the sun(immune system) and eat the food their body was designed to (grass). Again, I NEVER mentioned any of this. I never even offered my opinion. The title came from how I viewed the information from the study. Which if you want to get into in, would be the only part that is my opinion. The quote is coming directly from the link. It is your opinion that I misrepresented facts. I am a trained clinical holistic nutritionist and my education tends to fly in the face of the main stream thinking, but it doesn't make it wrong. It's progressive and more and more what I learned is becoming mainstream info. One day we will look back in shock and horror at what was allowed to pass for food! Bottom line EAT WHOLE FOODS> That's my agenda, if you really want to break it down. I beg to differ. By putting the word commercial in the title you are implying there is an alternative.Since you have pushed raw milk in other posts it is not a leap to see why you posted this and titled the article the way you did. Most ,if not all of those chemicals are frequently found in the water supply and thereby would impact organic milk and raw milk as well -unless your cows are drinking *special* water. Most people do not take the time to dig deeper into articles cited and therefore are going by your weak summary which did not report on what the article was really revealing.Yes you claim to be an authority on the subject and as such you have an obligation to be as accurate as possible and not pick and choose details that follow your belief system. Actually, the study was done on COMMERCIAL MILK. Organic and/or raw milk was not used, so the title is accurate. 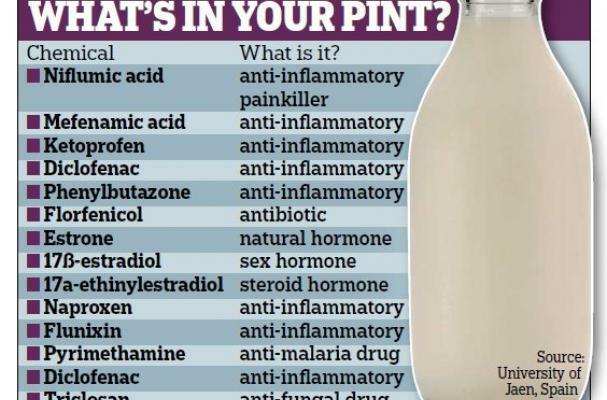 If they do a study on raw milk with these findings, then I will put that in the title. Again, I DID NOT MENTION RAW MILK OR ORGANIC MILK in my article. Therefore, there is nothing "irresponsible" about it. The title is based again on the FACTS of the article. I stand by it, and will continue to write articles that help people understand the a lot of the food supply is toxic. The funny part is that I don't even eat dairy. So, it's not even personal. I just think people have a right to know, so I shared an article based on research. And yes, as a nutritionist, I will write articles that match my belief system. I am not a journalist, I am a nutritionist who started a blog and others took to it. Then Foodista hired me to write about health and nutrition from my POV. There are plenty of others who write for the site that take another POV. They wanted all angles covered. I have not misrepresented the truth in this article. I did not mention anything other than what was written in the article. Many times I do offer my opinion, this time I did not. Saying that's what I did does not make it so.